MP would like to welcome Sara Sullivan, a nutritionist from Yarmouth, back as a guest blogger today. Sara offers wonderful ideas for healthy meals, gorgeous salads, and smoothies on her blog, sarasulllivan.com. For Valentine’s Day, she has delicious, no-bake dessert recipes to share. Take it away, Sara…. Grocery store candy? Not a chance. You’ve printed out cards, made cute crafts, and now you are ready to make some sweets for your pint-sized Valentine. Let’s be honest, Valentine’s Day eating is really about dessert. What better way to celebrate than with fun and healthy treats? Nothing says I love you more than this homemade treat. My peppermint patties are indulgent, guilt-free, and totally healthy. And no one will believe these treats are all natural. I promise! Blend all ingredients (except dark chocolate) together in your food processor until smooth. Roll the mixture into balls with your hands and flatten it into patties. Set the patties on a baking sheet lined with parchment paper and place in the freezer for 20 minutes. Next, melt your chocolate bars in a saucepan over low heat. Using a tablespoon, dip your frozen patties in the chocolate sauce and carefully place them back on the baking sheet. Return the baking sheet to the freezer for 15 minutes or until the chocolate-covered patties are cool. Your treats can be stored in an airtight container in the fridge or freezer. Enjoy! Spoil the ones you love by whipping up something sweet and healthy! Place almonds in your food processor and process into a fine powder. Next, add your dates, vanilla, lemon juice and lemon zest. Process again until well mixed. This may take a few minutes. Place your dried coconut in a large mixing bowl, and add the processed mixture. Mix everything together with clean hands so that the mixture is nicely combined. Transfer your lemon bar dough into a 9″ x 9″ pan. Firmly press the mixture into the pan with your hands. Refrigerate your lemon bars for about an hour so that they are easy to cut into squares. There is only a handful of ingredients in these peanut butter cups. Seriously, can life get any better? I practically fell on the floor after my first bite. For the cups: toss all the ingredients (except dark chocolate) in your food processor and pulse until it becomes a dough like consistency. If the mixture is too dry, add a bit more peanut butter. Press into lined mini cupcake tins, but leave a bit of room on the top for the chocolate. Melt the chocolate bars in a small saucepan over very low heat. Pour the melted chocolate on top of the peanut butter mixture and place the cups in the fridge overnight. Don’t you feel better already? Enjoy and Happy Valentine’s Day! yea, thank you very much !!! You’re welcome, Lisa. Send me your email address, so I can put you in touch with Live ME. 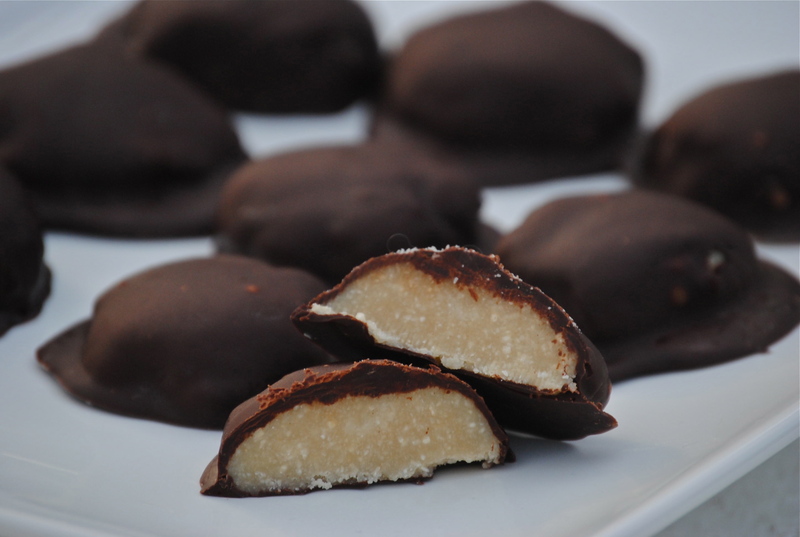 Can hazelnuts or walnuts be subbed for the cashews in the peppermint patties?